If you have a great new idea for a business, the first thing you’ll want to do is research. After all, research is how you can get the information you need to learn about the industry, the products and services already available, and the problems people are having. Entrepreneurs who have brilliant app ideas cannot profit off of them if they do not research their target markets. By conducting research as an entrepreneur, you will also understand how your potential customers understand the problem, and point you toward solutions. How should you go about research? 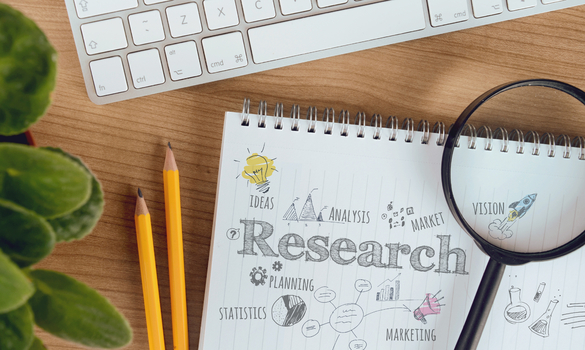 Read on to find the top key research tips to guide your efforts. When you’re beginning your research process, start with a wide-angle lens approach. Before you can get nitty-gritty, you want to identify market opportunities for growth and find which research areas to focus on first. Some macroeconomic research may be precisely the thing you need to understand the big picture in your chosen industry. You might also be surprised at the power of market research database tools, which can provide you with important statistical data about your target markets. What you’re likely to find is that the clarity of this kind of eagle’s-eye view invites numerous questions and observations that can help you in the next phases of your research process, as you narrow your focus. Now that you’ve done your big-picture, wide-angle lens research, it’s time to clarify the problems that exist in the industry. This means sifting through the information available to figure out where the real issues are and what people are wanting to be done about them. One of the simplest and most powerful ways to accomplish this is to use simple Q&A sites to figure out what people are saying about the problems you are investigating. What issues do people have, and what solutions are they talking about? By answering this question, you will be able to develop creative content ideas that will boost your customer base and earn you a decent startup profit. Of course, you can also talk to people and ask them about their problems. Some sites make this very easy, with a feature that allows you to ask a question – anonymously, if you want – and solicit answers from specific people who are likely to bring in many views and replies. This is an important thing for every business to consider, and it’s something you can do repeatedly at any stage of your research process. Think about it: while it makes sense to start by thinking about your ideal customer, it’s also a good idea to take stock after you’ve done your wide-angle lens research and sought to clarify problems. Once you’re at the stage of clarifying problems, it should start to become obvious who fits into this type of customer. If what you’re finding is that the profile that emerges is at odds with your preconceptions, think about what else needs to change and how you need to shift your thinking. Who needs what you’re offering the most? If you know the answer to that, you’ll know who to market to. Here’s a key hint: they’ll be the people who have the most trouble with the thing you’re offering to do for them, and that’s why they’ll be so eager to work with you. Now that you have your ideal customer situated in the context of an industry, and you know they need what you’re offering, it’s important to understand how they understand the problem that they’re having. For your ideal customer, how does this problem manifest? What is the pain point? What do they think the solution to their problem is? Answer these questions, and you’ll be on the right track. One way to do so is by conducting online focus groups as tools for market research. You may find that your idea customer has a number of ideas about how to solve their problem, or at least about how it should be solved ideally. Pay attention to those ideas and opinions. Of course, you may also find people are completely stumped. This is perhaps even better, if it allows you to offer them a way to define the solution to their problem. Either way, focus on solutions, and you’ll be in a good position to generate, test, and refine the key ideas for your business. As you use your research to develop a business plan, it’s a good idea to keep track of the costs associated with your business idea. In particular, you’ll want to think about your own living expenses, the location of your business and costs associated with that, any supplies you’ll need, marketing, and the like. Obviously if you’re planning on a home business, you’ll be able to save in terms of location, but it’s still worth considering what supplies you’ll need – and these might include permits, depending on the nature of your business.